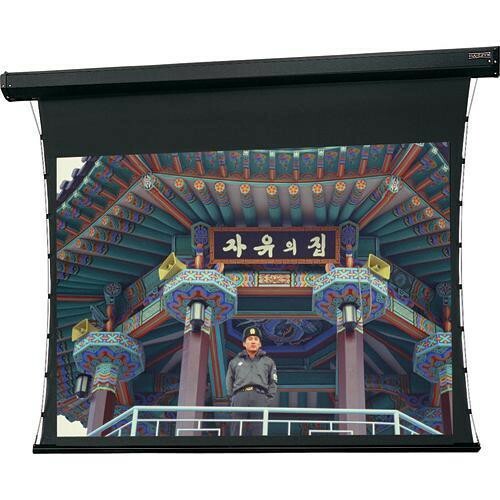 The Dalite 10 x 10' Cosmopolitan Tensioned Electrol Projection Screen is a high-quality screen that features a patented in-the-roller motor mounting system for quiet operation. This screen will serve you well when you need a motorized screen that cannot be recessed. The tensioning aspect of this screen assures that the image will stay perfectly flat. Horizontal tension is maintained using a tab guide system. Vertical tension is stabilized via a slat bar with added weight. The motor is an oiled-for-life, geared system with a thermal cutoff to prevent burnouts. In addition, there is an electric brake which helps prevent "coasting" when the screen is either raised or lowered to the desired height. With the simple flip of its 3-way switch, the Cosmopolitan efficiently and smoothly raises and lowers. Even tension is maintained by its tab guided system which provides a flat, even projection surface. Box Dimensions (LxWxH) 154.0 x 13.0 x 10.0"